Medium-priced kitchen faucets have a long list of pros and the Moen 5995SRS doesn’t disappoint. By offering a lot of interesting features, this model may sway buyers considering higher priced faucets. The gorgeous finish resists water spots and fingerprints, keeping it looking as good as new no matter how many people pass through your kitchen. The spray head in a pull-down system has never been this easy to use, with the reflex system giving you full movement while offering secure docking when not in use. The spray head will never hang, wear out, or malfunction from using the hose. Installation is handled by the patented Hydrolock quick connect system, so not only will it be easy to install but also won’t take up your time. The entire system can be installed through 1 or 3 holes and an escutcheon is included at no extra cost. There is a limited lifetime warranty included for full protection of your purchase, with technical support that is quick to respond and a pleasure to deal with. There are a lot of finishes to choose from with the Moen 5995SRS ranging from spot resist stainless and oil-rubbed bronze to matte black and chrome. They all offer unique styling that makes each finish stand out on its own. 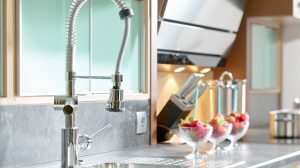 Offering one of the longest hoses on the market, the 68-inch braided hose from this high-arc faucet will just about go anywhere you need a kitchen spray head to go and then some. With such a long hose, it has multiple uses for either a small or large kitchen. With a hose of this length, it’s important to ensure that it will return to its original docked position if fully extended; the answer is an astounding yes. No matter how long you stretch it, the unit is designed to always return to normal every time without wearing out. Exclusive to Moen faucets is the Hydrolock installation system that eliminates the frustration of installing water lines and turns it into a simplified process. The tool-free setup is one of the many wonders of this system, and when done correctly, 100% of Hydrolock installations go smoothly. The unit weighs 6.2 pounds with dimensions of 24.8 x 12.2 x 3.5 inches. The style is transitional and it has a flow rate of 1.5 GPM — on the lower end of the scale compared to other models in the industry. The lower GPM allows for better control with the spray head, so it has its benefits. When making your purchase, take note of the arc and the product dimensions, as this will be the factor that results in a perfect stress-free installation or one that leaves you frustrated. The perfect setup is one where the faucet extends right to the middle of the sink, so not too close to the back of the sink and not too far forward so that it is precariously close to the edge. This is why the dimensions of the kitchen faucet are so important when making a purchase, as you’ll need to check what space you have at your sink area and figure out if it will be the right fit. Most of the time it won’t be a problem, even without the measurements. But when spending money like this, it is always better to be safe than sorry. As a reference, a bar sink would run into problems with the current model configuration, but an average kitchen island sink would be just fine. Lastly, the spray button on the spray head does not stay down when you release it. So to keep the faucet in spray mode, you have to hold down the button while using it. For some, this is a desirable feature to keep kids from playing with it; for others, it may be a headache. Staying in the same family, the Moen 7594SRS Arbor One-Handle High Arc Pull down Kitchen Faucet Featuring Reflex is a good comparison to the 5995SRS and is considered an upgraded version. At a slightly higher price, it is hard to consider the purchase of the 7594SRS over the 5995SRS, especially because the features are so similar. The big difference is that the upgraded version comes with an optional MotionSense feature in one of its styles, so if you’re looking for the 5995SRS with motion activation, the 7594SRS is the one for you. If motion activation doesn’t matter to you, then stick with the original and enjoy the lower price. Moen 5995SRS came onto the scene as a high-priced kitchen faucet and has continually dropped over the years. Chances are it won’t drop anymore, especially with the upgraded version of the unit staying steady at its current price. Interested shoppers should be pretty content with the average price and go for it while stock is high. Demand is expected to increase towards the end of the year, so there is no guarantee that all of the finishes will be available without a long waiting period. It’s not often that the upgraded version of a faucet gets upstaged by one of its older versions, but that seems to be the case here. The Moen 5995SRS is from a series that is still at the top of its game and is clearly one of Moen’s best products. The price is low enough to not scare away potential buyers and there are so many finishes to choose from that consumers are really spoiled for choice. Such beautiful finishes can be a nightmare to clean, but Moen went the extra mile and not only made it fingerprint resistant but also protected it against water spots. Consumers without a water softener installed can consider this unit self-protected as far as kitchen appliances go. With Moen’s great customer support, if something does go wrong, you will be well taken care of. The included escutcheon makes this an easy decision because you won’t have to shell out more cash for the extra item. All of this combined with one of the longest hoses in the industry makes this one of the best kitchen faucets available, and all without breaking the bank. Buyers that need a little relief from overpriced kitchen faucets on the market need look no further than this Moen model. 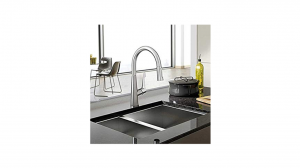 The Moen 5995SRS has all of the great features you could want in a kitchen faucet without any of the unnecessary embellishments to inflate the price. This all comes from a trusted brand that is a leader in its industry. Even as an older model, this still reigns as one of the best on the market, with sales that are stronger than many of the newly released kitchen faucets.